1. 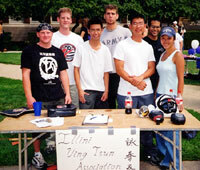 Signing new members on 'Quad Day' at the University of Illinois - August 2001. 6. Another group photo from May 2000. 2. Attracting new members with their dashing good looks... 7. Group chi-sao during class. 4. Instructor Ken leads a workout at UIUC's 'combat room'. 9. Sifu Phil leads the class in chain punching. 5.Instructor Ken and Instructor Henry works with the Ving Tsun Six-and-a-Half-Point Pole. 10. Sifu Phil in 1998 explaining a few Ving Tsun concepts to the class.